Last year, a family of osprey took up residence in one of Spokane's most iconic landmarks. There's an osprey family living at the top of the Riverfront Park Pavilion, and we've got pictures: Plus, bonus pictures of Spokane's downtown beaver colony! Maybe this was always destined to be, we wondered. Maybe the osprey would become a permanent tenant of the Pavilion and would continue to delight and astonish visitors for years to come. Maybe the parks department could go one step further, we thought, and actually, install a permanent nest platform at the spire of the Pavilion. But it wasn't to be. Today, if you peer up at the Pavilion you won't see an osprey nest. Instead, you'll see this strange piping structure, that looks a little bit like when I try to assemble a tent. An osprey nest excluder, as you might expect, excludes osprey from forming nests. Parks department spokeswoman Fianna Dickson says the nest was removed after consultation with the Washington Department of Fish and Wildlife. "They advised it was not an ideal nesting location because the area will need to be accessed for routine maintenance, and will feature light blades and noise from concerts and other large events," Dickson says. Carrie Lowe, Washington Department of Fish and Wildlife assistant district biologist, confirms that the parks department handled the nest appropriately. "I was contacted by the city of Spokane Riverfront Park program manager, Barry Ellison. He was trying to find out what they should do about it," Lowe says. "I think they were concerned if they had a group of people, the osprey would be dive-bombing people or pooping all over their stage." Generally, ospreys are fairly tolerant of human activity. Lowe mentions attending a concert up at Sandpoint, where an osprey was at the audience. "There's a nesting osprey at the power pole right there at a venue," Lowe says. "It didn't seem to be particularly bothered." Still, it's not unusual for property owners to call with osprey concerns, particularly when they begin nesting in cell phone towers, Lowe says. Lowe says she helped the parks department get a permit to remove the osprey nest outside of nesting season. 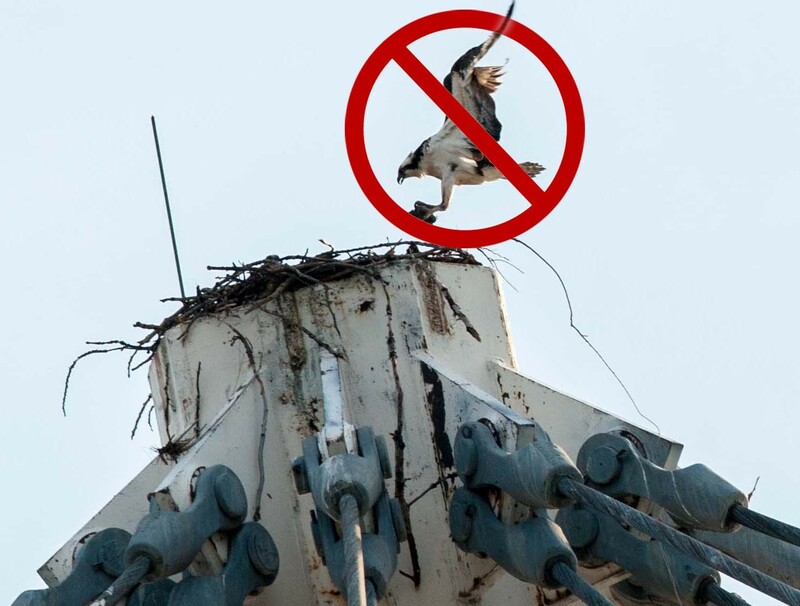 From there, Lowe says, she usually recommends that the property owner find some way of discouraging the osprey from using the structure as a nest again. "We wouldn’t keep permitting the same people over and over, without some sort of effort to avoid the problem," Lowe says. That can mean adding spikes to the structure — clearly the most metal option — or installing a domed nest excluder (as you can see in the photo). She'll also encourage property owners to construct an even better, taller, alternative osprey nest nearby. But with a structure as big as the pavilion, that's not necessarily practical. Our suggestion? An osprey nest platform, 250 feet high, jutting directly out of Riverfront Park Clocktower. This story has been updated with additional comment from the parks department.